In recent years there have been concerns about the influence it is possible to exert over election results through social media. As well as fears relating to fake news and misinformation, there have also been calls for greater transparency when it comes to revealing the funding of political advertising. To address some of these concerns, Facebook has announced that any ads running in the UK that make reference to political figures will have to publicly reveal the identity of the organization or individual that paid for them. The new rules about transparency will apply to both Facebook and Instagram. In addition to making it clear where the funding for an ad has come from, Facebook says that it will also create an Ad Library where this information can be accessed for seven years. The Ad Library will reveal not only the funder, but also details about the number of people who have seen an ad, the advertising budget that was used, and also which other ads a page is running. From today, all advertisers wanting to run ads in the UK that reference political figures, political parties, elections, legislation before Parliament and past referenda that are the subject of national debate, will need to verify their identity and location and carry a "Paid for by" disclaimer. We see this as an important part of ensuring electoral integrity and helping people understand who they are engaging with. We recognise that this is going to be a significant change for people who use our service to publish this type of ad. While the vast majority of ads on Facebook are run by legitimate organisations, we know that there are bad actors that try to misuse our platform. By having people verify who they are, we believe it will help prevent abuse. 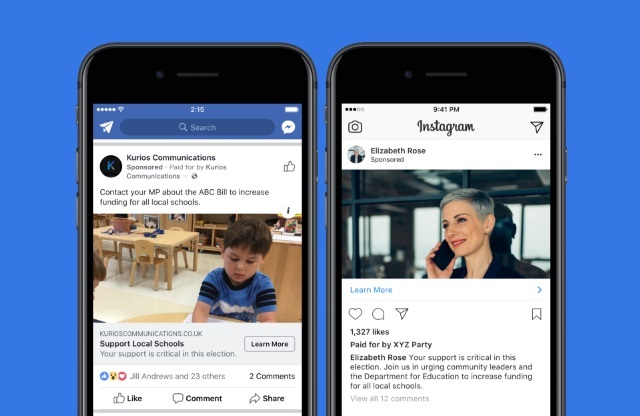 Social media users are invited to report any ads they may encounter that they do not believe are labelled appropriately, and Facebook says that it will investigate.